Moore Haven, Florida is a small town of about 1700 people located on the southwest shoreline of Lake Okeechobee. Although it is the county seat of Glades County, it is a sleepy little town that has little industry and infrastructure and a lot of poverty. Moore Haven is home to the Annual Chalo Nitka Festival, which is held the first weekend in March. The first Chalo Nitka Festival was held in 1949 with LaBelle, Pahokee, Belle Glade and Moore Haven High School bands and colorful floats leading a parade down Main Street. Chalo Nitka is Seminole for “Big Bass”. the festival became an annual event, featuring an annual fishing tournament saluting the Black Bass. Fishing, fish camps and fishing guiding are important parts of the Moore Haven economy. The site of Moore Haven was first occupied by early native Americans, and later Seminoles. The town was named after it founder, James A. Moore. 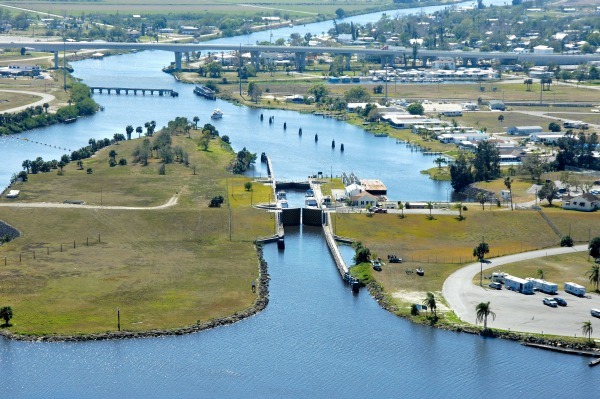 In its early days, Moore Haven was often called "Little Chicago" because it was located at the junction of the Caloosahatchee River Canal and Lake Okeechobee. It was a signficant boom town in the days when riverboat traffic came past Moore Haven with its cargo of cattle, fruit and vegetables from central Florida. The Great Miami Hurricane of 1926 devastated the area. The storm surge from the lake caused widespread death and destruction. The town didn't have a chance to recover because it was hit soon after by the 1928Okeechobee Hurricane. This decimated areas that had escaped damage in 1926. Best Western of Clewiston, 1020 West Sugarland, Clewiston, Florida 33440. Not too far from Moore Haven, clean with reasonable rates. Clewiston Inn, 108 Royal Palm Ave., Clewiston, Fl 33440. Tel: 800-749-4466. An historic hotel with clean old fashioned rooms and reasonable rates. Good dining room. The Clewiston Inn is close to Moore Haven, Florida. Colonial Dining Room, 108 Royal Palm Ave., Clewiston, Fl 33440. This is the restaurant at the Clewiston Inn. One of the best fried catfish dinners in the area. The Clewiston Inn, 108 Royal Palm Ave., Clewiston, Fl 33440. Tel: 800-749-4466.